Traverse City Events: Talking with Elmore Leonard, best-selling crime writer of 45 books and guest of the Traverse City National Writers Series. 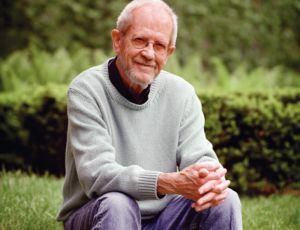 Elmore Leonard is one of America’s most gifted and prolific writers, credited with 45 books, multiple screenplays and a hit TV series “Justified” on FX, based on his popular character U.S. Marshal Raylan Givens. Countless of his best-known works have been adapted into blockbuster films, including Get Shorty, Out of Sight and Rum Punch, which was filmed by Quentin Tarentino as Jackie Brown. His short stories also became the basis for movies including 3:10 to Yuma and The Tall T.
This Saturday, July 2, Leonard will take the stage at Clinch Park Marina for a special partnership event between the Traverse City National Writers Series and the National Cherry Festival to discuss his life and work with best-selling author and Series founder Doug Stanton. In a recent phone interview with MyNorth, Leonard shared his thoughts on the numerous screen adaptations of his books, the role that Michigan has played in his career, and his thoughts on returning to Traverse City and the National Writers Series. MyNorth: Several of your books have been adapted into hit films. As a writer, when you learn one of your works is headed to the screen, does that prospect excite you or fill you with dread? Elmore Leonard: I’m always optimistic. I always think it’s going to be great. And you know, sometimes it’s not bad. (laughs) Sometimes it’s not good, either, but that’s how it goes. I just figure, if it’s bad, it’s bad. There’s nothing I can do about it. So I’m realistic, but hopeful. MyNorth: Do you think storytelling transcends the medium? Or do television and film either limit or expand the experience of a viewer compared to what’s on the written page? Elmore Leonard: (The screen) is certainly a different look. It never looks the way I think it will. I don’t picture a set when I write; I picture a scene unfolding. When I watch scenes in a movie, I can’t help but think about the way they were shot. Most of my reaction to a film is based on how well the dialogue is handled. I’m paying attention to whether the actors are funny or serious, and how they’re interpreting the words. This was something I told the director of Get Shorty. I said, “When the actors say their lines, don’t have anyone else grin or laugh or wink at what they’re saying. Because these guys are being serious. If there’s humor in the dialogue, leave it up to the audience to find that. They want to laugh.” The director listened to that, and the film worked. But then there was another (John) Travolta picture (Be Cool), and the director let the actors do whatever they wanted. And it was a mess. I’ve only been able to watch it once. I write my books in a way that are easily adaptable, which means they all have scenes with a lot of dialogue. So how that dialogue is portrayed is important. MyNorth: Justified has been a big hit for FX, and seems to be an example of where getting the tone of the dialogue right has contributed largely to the project’s success. What has been your impression of the show? Elmore Leonard: I love it. All the actors are so good. Their accents are perfect! I couldn’t be more pleased. I wrote a book called Raylan coming out at the end of this year, and (the writers) have already begun using scenes from it for next season. Timothy (Olyphant) plays the part exactly the way I wrote it. He’s a little laid back, he’s got those great scene-ending lines. The women on the show are so good, too. I think it’s a wonder. MyNorth: A film adaptation of Freaky Deaky is underway in Detroit, which is where the book is set. What influence has Michigan had on your writing and career? Elmore Leonard: I’ve been here since ’34, so that says something. (laughs) I’ve set six or seven stories in Detroit, because I live here and it’s accessible. I can talk to the cops and homicide people. My researcher also knows those guys well. Out of Sight was made here, and they used Detroit very well. Now with the film tax incentives, it seems like a perfect opportunity for Freaky Deaky to be made here. MyNorth: You were one of the first inaugural guests of the National Writers Series back in 2009. What’s your relationship like with Doug Stanton? MyNorth: What are your thoughts on coming back to Traverse City? Elmore Leonard: Oh, it’s the capital of holiday time in Michigan. It’s a great place to be! I’m getting anxious to go, really, now that we’re talking about it. MyNorth: What are you working on next? Elmore Leonard: I’m working on a Western. I haven’t written one since 1979, and I just feel like doing a Western. I’m going to take a short story I wrote ("The Tonto Woman") and expand it into a book. It’s about a woman taken by the Apache, and while she’s with them they tattoo her face. When she’s eventually released, her husband – who’s become a successful cattle rancher – doesn’t want to look at her. She realizes she had more fun with the Indians than she did with him, anyway, and things go from there. That’s what I’m working on now. Watch a video of Doug and Anne Stanton, co-founders of the National Writers Series, discuss Elmore Leonard's work. Read and watch more interviews with guests of the Traverse City National Writers Series! Click here for the fall 2013 National Writers Series Lineup!